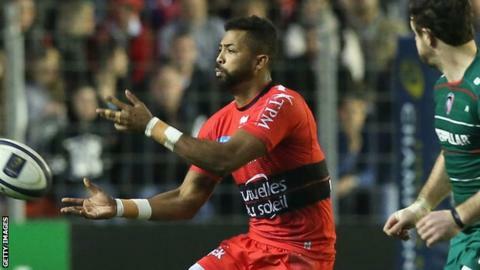 Toulon's Delon Armitage has been banned for 12 weeks for using foul and abusive language towards Leicester Tigers fans after the European Rugby Champions Cup match between the two clubs. Former England full-back Armitage, 31, pleaded not guilty at a misconduct hearing on Wednesday. But a disciplinary committee ruled he had "conducted himself in an unsportsmanlike manner", despite accepting he was "provoked". Armitage can play from 9 March 2015. The incident occurred just before team-mate Martin Castrogiovanni launched into a post-match rant to journalists about Leicester director of rugby Richard Cockerill. Castrogiovanni was fined 10,000 euro (£8,000) fine and given a suspended four-game ban. The committee said Armitage "may have brought into disrepute" the sport by "making a number of comments to, or within earshot of, spectators using foul and abusive language". However, it cleared him of one comment allegedly made during the game at Welford Road on 7 December because "inconsistencies in the evidence were too great". Armitage's ban was increased from a starting point of eight weeks to 12 because it was his second post-match misconduct case in four years. He pushed an anti-doping officer during a drugs test after playing for London Irish against Bath on 1 January 2011.